January 2004- My twin baby girls were 5 months old. I bit my lip hard in an effort not to cry. No one in that room knew that Annie was an identical twin. Nobody knew about Audrey, our other baby at home. The looks of shock on the medical team’s faces told me, this was not good news. After Annie’s diagnosis at Sick Kids, we were warned to keep our eye on Audrey and make the necessary calls to the doctor to get some tests set up for her as well. 3 weeks later Audrey began having seizures and the diagnosis followed. Audrey too has TSC. My toddlers were not progressing well. They were obsessive/compulsive; which were the beginning signs that they might also have autism. They didn’t know who I was. THIS was not what I had expected my life to be. This season was not ending. “How can God expect me to take care of my two “typical” children as well as my babies, if I am tired and unable to cope?” My twin toddlers were insomniacs who had seizures and so many other issues. The Neurologist said, “most people with neurological dysfunction HAVE sleep disorder. I was out of patience. I shook my fist at God. ….and I began to receive truth. God had not forgotten us. decide to stop being angry at God and look for ways to use my wakeful times for something good. I chose to give God my worries, my fears and my broken heart. I chose to turn on the kettle, at 4am, have some tea and open my Bible. In the wee hours of the night, sometimes, I chose to connect with people on the internet, whose children had also been diagnosed with Tuberous Sclerosis and Epilepsy. I chose to be a part of a support network of families whose lives were touched by TSC. I chose to stay connected with my church family. I chose to be thankful. I became less focused on the injustice and difficulty of our situation and more focused on the goodness and the faithfulness of God. I began to experience something supernatural. Joy in the midst of Epilepsy, and TSC, and insomnia, and autism and…. I realized that God doesn’t make mistakes. He had entrusted these two “special” girls to our family for a reason. Lily and Russell are the specific brother and sister for Annie and Audrey. Kirk and I are the specific parents God meant for them all to have. 2014 – My twin baby girls are 10year old toddlers. Tuberous Sclerosis Complex has caused our daughters to have Epilepsy (seizures), global developmental delay, and autism. We are still forcing a total of 12-20 pills down Annie and Audrey’s throats, 3 times a day, just to keep seizures under control. Although this is our “new normal”, it’s a task which I find never gets easier. Annie and Audrey are still affected by TSC and Epilepsy but for nearly 6 yrs Audrey has been 90% seizure-free, and on less medication. Annie has had some times of seizure control but is still on much more medication and struggles with aggression when seizures hit. 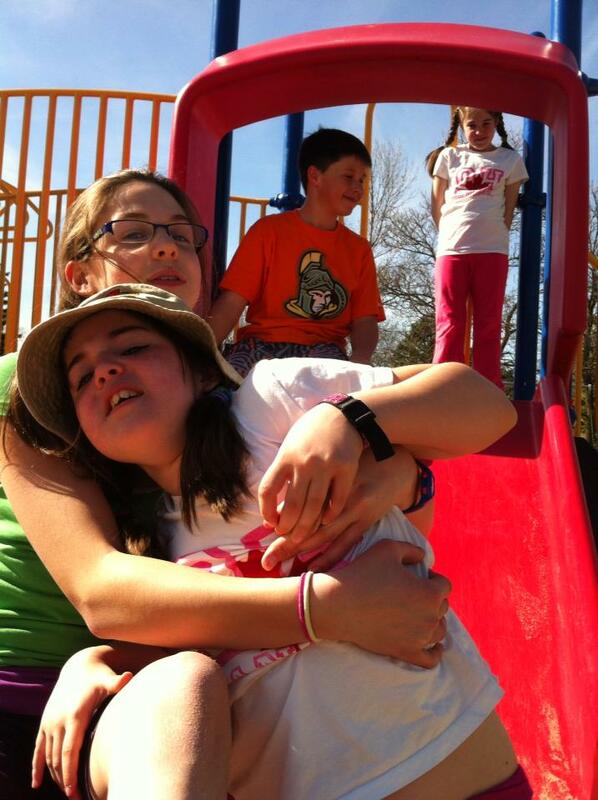 Both Annie and Audrey attend our local school and Pioneer Clubs (at church), and their peers seem to love them. Kirk and I thank God for tiny victories and still believe in healing. I still pray for more patience, which I never seem to have enough of. I still give thanks for the many blessings and milestones, big or small….and write them down. I still have questions and wonder about the future. I still get tired of changing diapers, giving meds and troubleshooting seizures and aggressive behaviours. I am not beaten down and I am not destroyed. The Holy Spirit has given me unexplainable peace about my girls never leaving home. I am stronger now and closer to the Lord than ever before. Kirk and I are partners on this journey and our marriage is strengthened in spite of the odds. This journey with Epilepsy and TSC has not been easy and continues to be a challenge every single day, but it is the path God has put us on …and we trust Him. The truth is God hasn’t shown me what will happen next year, next month or even tomorrow but I’m not worried or anxious about it. I see this life as a privilege and an honour; one I cannot live out well on my own strength. On my own, I am weak, angry, anxious and confused. With God, I am strong, loving, carefree and wise. I have experienced true joy when my children learn something new, sing and dance, or simply play the way other children play. I have also experienced true grief over the loss of dreams and what I had expected this life to be. Grief that never seems to fully go away because the seizures never really stop, and my babies never really get to grow up. But…God has given me dreams for the future and excitement about what might lie ahead. He is here, walking with me, talking with me, and carrying me when weariness or chronic sorrow overwhelms me. When I lean over and kiss Annie’s forehead and I tell her I love her, I am quite sure she will not tell me, “I love you too” or kiss me back. In fact, she may even react with kicking, pinching and crying. She can’t help it. She has epilepsy…seizures every day, is developmentally two years old and autistic…all getting in the way of her being the person she was created to be. In a similar way, when God leans in to draw me closer to Himself, sometimes through difficult circumstances, sometimes I react badly- with kicking, pinching and crying. I get frustrated, just like Annie and Audrey do and I want to push God away. My selfishness gets in the way.Thankfully, God is unchanging and He loves me anyway. His patience and grace overwhelms me and I know He wants the best for me, just as I want the best for my children. My character is being shaped by a very big and very gracious God, who cares enough about me that He is still interested in changing me-making me holy- as I choose to walk by faith, lay all my cares at His feet and ask Him to forgive me my mistakes.And He doesn’t want to see me fail.